As there’s an abundance of stress in the modern world, it’s far more difficult than ever before to embody a sense of relaxation. When you’re looking for your own specific way to wellness, you have consider if you are living a relaxed life, or if are you simply more likely to be predisposed to stress than the person next to you. Learning how to relax isn’t necessarily a difficult concept to grasp, but to begin on this journey, you must determine how stressed you are in the first place. When you think of my homeland of Canada, you probably think of lots of ‘typically Canadian’ things. From poutine to ice hockey, maybe you believe that you have a pretty good idea of what Canada is all about, and what you can do here. Even if you’ve been to Canada before, have you really had a true Canadian experience? It’s a massive country, so getting a feel for it isn’t something that you can do in one short trip — in fact, I haven’t truly developed a sense of my own country until I began travelling from province to province in the past couple of years. There’s a lot to see and do, and you don’t want to miss out on some of the most essential Canadian experiences available. Traveling abroad with a big group of friends can be so much fun. It gives you a chance to ignore the pressures of work for a few days, and to forget all of your worries back home. You can have a great time catching up with your best friends and seeing some of the most exciting destinations that the world has to offer. It’s one of the most popular destinations for young travellers and backpackers. The region is made up of so many countries that border one another, making it’s the perfect place to go country hopping (even if you are only there for one week, I’m sure you could fit in a couple of countries). Not only that, but many countries in this area are very cheap, and you will be able to get by on very little indeed. So, are you tempted to go traveling in Southeast Asia? It is important to get your injections for India if you plan to travel there. You certainly won’t regret it! However, before you jet off, it’s important that you know a few dos and don’ts. You might experience culture shock while you are there, as the countries are so different from the Western world. Following all of these tips though, should help you enjoy your time there and keep you safe, too. Boarding the beautiful train in Stettler before heading out to Big Valley for dinner. Last month, during my time in Edmonton, I went on the Alberta Prairie Railway excursion with my family, from Stettler to Big Valley. Shortly after I arrived in Alberta for my month-and-a-half long trip, I heard from my family as well as a few others that the Railway Excursions were a must-see while I was in town. With it only being a several hour drive outside of the city, we decided that this would be a really cool thing to do as a whole family. In fact, my cousins’ boyfriends came along with us, too. When I arrived at the Stettler train station and saw the massive locomotive parked out front, I was floored. The front engine looked like something out of the Harry Potter films, and the colours of the train were the perfect fit for the gorgeous rolling plains that we would soon be moving through on our way to a buffet dinner. Javert (Josh Davis) and Jean Valjean (Nick Cartell). Photo taken by Jen Bates for Broadway Across Canada. From the very first powerful notes of Overture/Work Song, Broadway Across Canada (BAC)‘s production of Les Misérables immediately sent goosebumps up my arms and neck. I sat on the edge of my seat, my lips mouthing the words of each song as one number led into the next. Despite having never seen Les Mis performed live before, it was a soundtrack that I grew up on. With my mum being a musical fanatic (and Les Misérables being among her favourite), I knew all the words to the play from the time I was a young child. From the get-go, I had listened to Colm Wilkinson as Jean Valjean on a soundtrack from the ’90s and truly couldn’t imagine anyone else portraying the character with the passion and beauty that he did. Coming to see BAC‘s production, I was worried that my first time seeing the musical would not live up to the expectations that I couldn’t but help set up in my mind; however, with the first few lines carried throughout the theatre by Nick Cartell (Valjean in the 2018 production I saw), I was completely floored. The goosebumps started. My eyes widened. I knew that the foundation for this incredible show had been blissfully set. 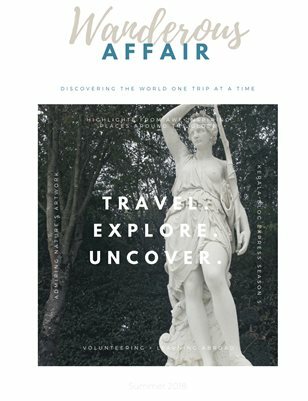 Volume 1, Issue 2 of Wanderoud Affair. This issue explores the places that left travellers completely awe-struck. Welcome to the second issue of Wanderous Affair magazine! After the tremendous success of the pilot issue, it only made sense to build off the foundation our amazing contributors began, as well as to put forward new articles written by some of the greatest nomadic authors and photographers that I have had the pleasure of connecting with. In this Summer 2018 issue, our writers explore a particularly special theme: a place in the world that left them absolutely awe-struck. For some it was places of great natural beauty, while with others it was the allure of man-made architecture. Some of these journeys took place recently, while others were experienced years ago. One common thread of all of these travels however, are the enduring memories that they have left with each individual. Moments that will never be forgotten. Have you ever had a sense that you’re not quite living up to your full potential? That there’s a dream to dream, and achieve, just beyond the corner of your imagination? Or maybe that you could be a much more dynamic version of yourself, if only you could bring your habits and thought processes under control? To a certain degree, being human is all about wrestling with your potential and seeing how much you can ultimately get out of the struggle. Certain vitamins, minerals, foods and health products such as Sierasil (more about Sierasil here) may help to sharpen you up; however, one of the most powerful overall practices for enhancing your well-being and achieving your full potential is by using positive visualization.